← STEADFASTNESS…One Word, Express In One Hundred Words In One Hundred Days. CHANGE…One Word, Express In One Hundred Words In One Hundred Days. Albert Einstein And Benjamin Franklin Defined Insanity As Doing The Same Thing Over And Over, Expecting Different Results. Life Is Change And Change Is Life. Greatness Is Born By Change. Success Is Unveil By Change And Ability Is Form By Change. Change Says Without Me It Is Impossible To Please Life. Whosoever That Want Life And Live In Abundance Must Be Ready To Do Something Different, Try Something Different And Create The Difference. Change Is A Force That Requires Everything Within You To Come Alive. You Are The Change: Everything Will Change If You Will Change. This entry was posted in Life and Time Management, Self Development, The Peace, The Secret, Vitamin Of The Mind, You! 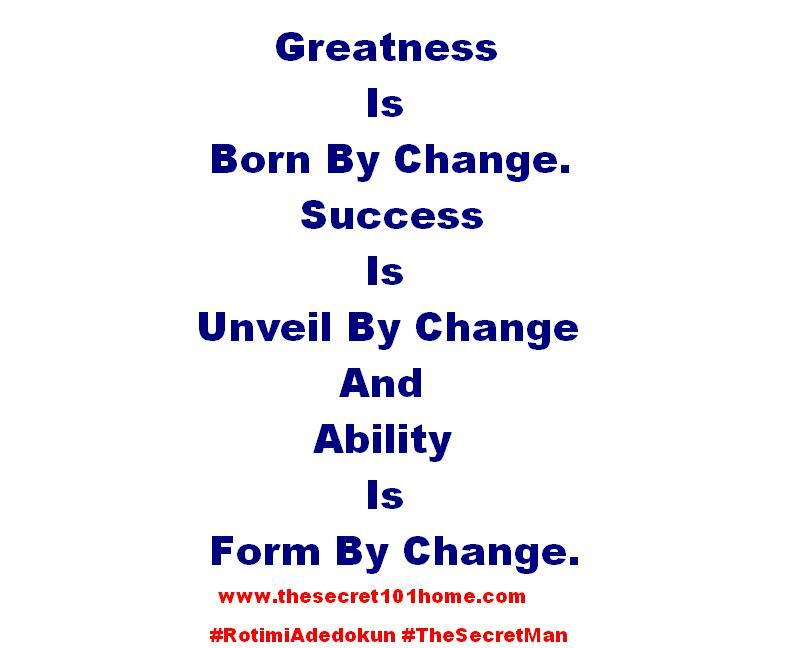 and tagged Albert Einstein, Bishop David Oyedepo, Change, How To Change The World, If You Will Change Everything Will Change For You, Jim Rohn, Rotimi Adedokun. Bookmark the permalink.